It is just the way it seem to be. 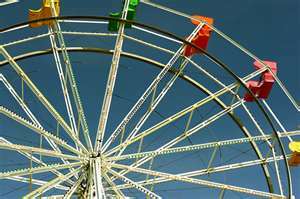 When you ride life’s wheel you have to be ready for the motions that make up the turns. You have to be prepared to know that there will be downs before ups, and know that the ups may not just be the opposite of the downward ride. It may be a whole new place to rise the height of the wheel. Part of the trip ahead is the anticipation as things start to change. Not worth resistance it is the place you should enjoy as the wheel turns. When you see it heading down you can do things to help turn it faster the other way. On the other hand, when it is turning up you may not be able to slow it down, or it may take more time to get to the top. Sometimes hearing the expression “just roll with it” reminds me of that. Making sure to roll with the changes, move with the day as God provided to us. Do the most with it, because how we spend each day is how we spend our lives. In the old days we used to say “Keep the Faith” or “Hang Loose”…Just keep remembering what is really important. I will be sending out good thoughts and prayers for your next adventure on the wheel. Having a PMA (like my dad used to say) Positive Mental Attitude… is a start, and you certainly seem like you have that on your journey!